A Literary Odyssey: Classics Circuit: The Winter of Our Discontent by John Steinbeck (Book 102). Classics Circuit: The Winter of Our Discontent by John Steinbeck (Book 102). I am happy to be a stop today for the Steinbeck Classics Circuit! For anyone unfamiliar with the circuit, it is a way for bloggers around the book blogging community to highlight some classic authors and their works! For a period of time, different bloggers will be posting their thoughts on the works they read. There are new posts every day, so I hope you'll head over to the Circuit's blog to check it out! 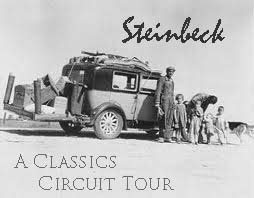 I was really excited to see that this circuit was going to be for John Steinbeck! I am relatively new to Steinbeck's work, but I have had a couple of really positive experiences. I am well on my way to declaring Steinbeck a favorite for life. Since I only had two of his novels left on my list, I feel I had an even harder choice. I decided long ago to leave The Grapes of Wrath until nearly the end of my project (mainly because I feel like I am going to LOVE it), so The Winter of Our Discontent was it for me! I was unsure what to think going in. Truth be told, when I was making my project list nearly two years ago, this novel was placed on the list instead of East of Eden purely because it is my brother-in-law's favorite by Steinbeck. I was hoping Kyle would have great taste. Turns out, he did. What Steinbeck does so well is capture the heart and spirit of Americans in different locales. I have found this to be true in the two other titles I've read (Travels with Charley and Of Mice and Men). He takes a small community and truly brings it to life. And while the characters in this one aren't necessarily lovable, he makes them realistic. They aren't perfect and their flaws are what drive the novel. I felt for them with every turn of the page. Ethan Hawley came from a wealthy family, but the family lost their money years before. Rather than being one of the most wealthy and influential families in town, the Hawley family suffers from some humiliation. Ethan works as a store clerk under a foreigner, his kids want what all the other kids have, and his wife seems to just make do with what she has. Ethan seems to struggle with who he is and where he wants to be. He wants money, assuming that having more of it will make his problems go away. So Ethan makes some phone calls and has some conversations that change his life dramatically. In the end, he gets what he wants. But, as the reader, and being inside Ethan's head, I had to ask myself for him, "was it worth it?" The fact is, Ethan does things to set his life in motion, at the expense of others. He gets what he wants by doing some pretty underhanded and immoral things. How could he possibly enjoy his new lifestyle? It is an interesting question Steinbeck poses. You can tell that throughout the novel Steinbeck has a very specific purpose in mind-to explore the moral degradation of America and her citizens. We all know that the American dream is to climb as high as you can on your blood, sweat, and tears, but it also comes with a price. Ethan Hawley seems okay with the price he pays (I wouldn't be). I was reminded a bit of The Great Gatsby when I read this. In Fitzgerald's novel, he also explores the American Dream and the rise to the top. He also shows the fall. Steinbeck and Fitzgerald both show how sometimes to get to the top, things have to be done. People have to be hurt. They both come to different conclusions, but the moral seems the same. In the beginning, I felt for Ethan. As someone who also works in a pretty crappy job, it is hard to keep your chin up and eyes focused on being okay with your status in life. But, as Ethan began to explore a seedier lifestyle, all similarities stopped. He seemed unfazed in hurting those around them or watching them fall. You have to wonder, how many people have done the same? Do they think it was worth it? Anyway, this was a fast read that kept me on my toes. It also makes me yearn for more Steinbeck, but I'm going to be strong and hold out. How many of you have read this one? Love it, hate it? What other Steinbeck novels should I read in the future? I've not read this one. I think that although Steinbeck may have been thinking about America, the issue is one that is more universal than that. Maybe we are just lucky in the West that we have the luxury to worry about the moral effects of our efforts. Great post. Thanks. Steinbeck is one of my favorites! I absolutely loved this book back in high school (a very long time ago) and have been thinking of a reread for some time. Sounds like it should be soon. East of Eden is one of my all-time favorite books. Hope you'll consider adding it to your list. Steinbeck is one of my absolute favourites - I enjoyed your review of the Winter of Our Discontent. The first three are absolute musts, in my opinion. Many have 'The Grapes of Wrath' as the pinnacle, but the other two struck a deeper chord with me - though it's unarguable that with Grapes, Steinbeck was able to encapsulate a time period and the struggle for existence in a changing world. Steinbeck is probably my absolute favourite author! I remember really loving The Winter of Our Discontent when I read it, but I definitely need to revisit it because that was a pretty long time ago. East of Eden is an absolute definite must read, imho, but I think The Grapes of Wrath is probably my favourite... to be honest, though, they're all great! Cannery Row is one of the funniest books Ive ever read. Totally redeemed Steinbeck for me after Grapes. Although I haven't read any others of his, thinking that my record so far of 50/50 love/hate isn't so good. Cannery also has my all-time favorite line from a book: "The road to hell is paved with unbought stuffed dogs." A member of my BookCrossing group did one of the best themed releases ever with this book. She left a copy at Home Depot the pipe insulating supplies. Amazingly, the person who found it loved Steinbeck and was overjoyed to find the book after being in a foul mood because the pipes in her house had frozen. The finder has since become an active member of our book group as a result. The only Steinbeck I've read are Grapes of Wrath and Of Mice and Men. I'm not sure I would say that I loved them so much as they were affecting. Powerful. I want to read both of them again, as well as East of Eden, and probably whatever else I come across! Definitely a writer I will return to. According to Eclectic Indulgence's list, since I absolutely hated the top three titles there, I seem pretty likely to enjoy this one! And like Jillian, I've always been attracted by the title. I enjoyed your review. I've never really thought about reading this book even though I loved East of Eden when I read it several years ago and am enjoying reading Grapes of Wrath now. After reading your review, I feel like I should read this one too. I love The Great Gatsby, and I would be interested to see how the two compare. I haven't read this one yet. I'm now afraid that other Steinbeck's won't be a super wonderful as EAST OF EDEN, which I've read twice now. This sounds like a good one to grab soon. I'm all for long novels, and Steinbeck has some wonderful ones, but good for him for giving us some really substantial stuff that doesn't take forever to read! Of course, that doesn't include The Pearl. I could do without that one. I haven't read this one yet, but I'm a unabashed Steinbeck fangirl so I'll get to it eventually. It is amazing how he brings communities and characters to life. I just love his writing. Even if you don't read it for your project, don't miss East of Eden. It's definitely in my top 5 of favorite books. It's amazing!